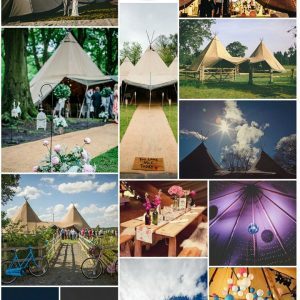 Here at Boho we LOVE Tipi weddings! Any sort of Marquee or Yurt wedding, but especially Tipi’s. 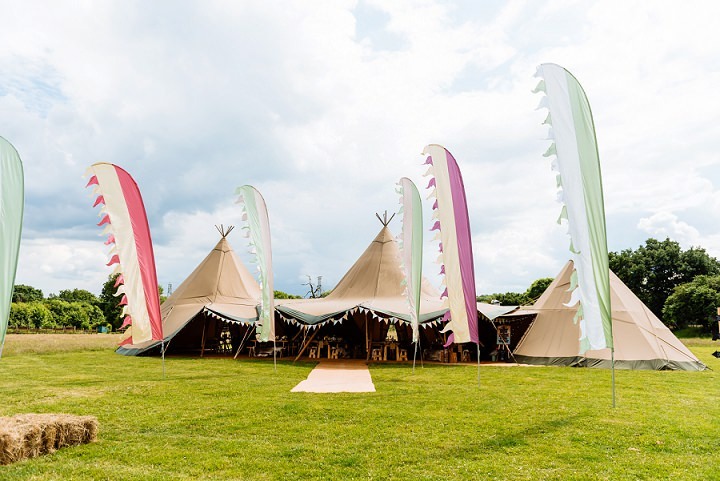 Now it’s it’s getting closer to summer it really is the perfect time to look at planning a Tipi wedding, but did you know that you can hold a Tipi wedding throughout the year, it doesn’t just have to be a summer thing?! 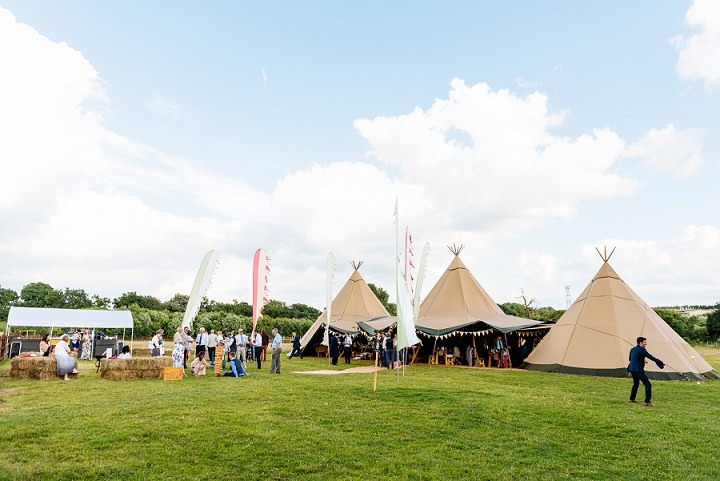 If you are in the process of planning a Tipi wedding or considering one, then this two-part blog series from Jacquie at Elite Tents is a must read for you. 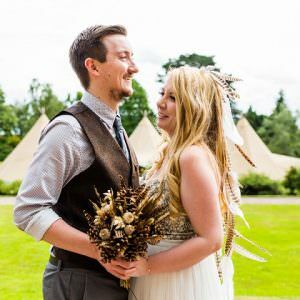 Jacquie is an absolute expert in her field so she has all the knowledge and advice you need for planning and organising a Tipi wedding. Part One is this morning and Jacquie will be back this afternoon with Part Two. Since Elite Tents was set up in 2010, I have been involved in planning almost 700 tipi outdoor weddings; I have seen the pitfalls, the details that can sometimes be overlooked, but most importantly those ideas that do work and will ensure that the wedding day is so amazing, memorable and enjoyable for the couple and all their guests that you won’t be surprised to learn that in my opinion the pros massively outweigh the cons. 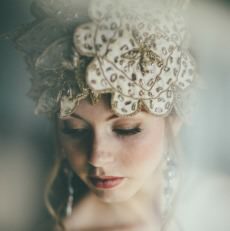 I am going to outline for you some of the tips which can help the cons be minimised and if you decide to implement them will make your wedding unique, personal and extra special for you, your family and your friends. The first and most important thing you need to get right – your venue. Searching for the perfect venue is to some a bit of a con of an outdoor wedding, it is hard to know where to start and there are so many choices in terms of the type, the cost and the facilities they offer that it can be overwhelming. But finding a venue can also be great fun. 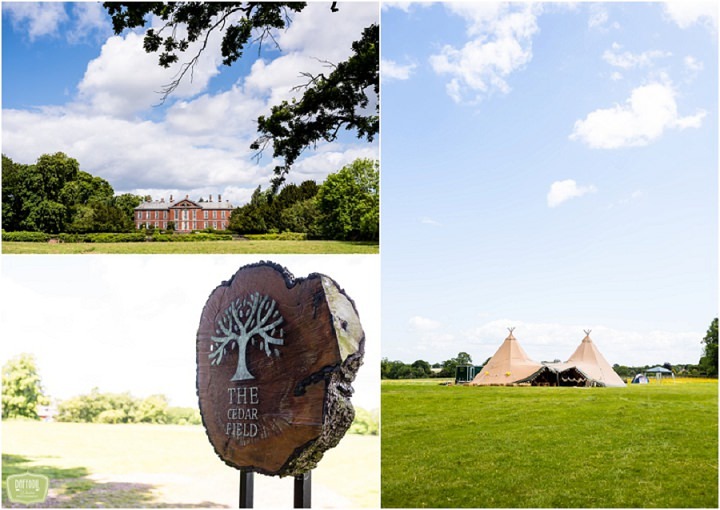 Often your tipi provider will have some ideas if you really don’t know where to start, (Elite work with over 50 venues across the Midlands for example), but the main thing is to make sure that whichever one you choose suits you. If you’re looking to have an outdoor wedding there are three main types of sites you can consider. 1) The first and usually most cost-effective option is if you know someone with a huge back garden, a farm, or an area of land they’re prepared to let you use. An area of land like this will need you to source power, toilets and possibly water too. 2) The second option is to find somewhere you can hire – there are more and more places becoming available these days including holiday cottages with land, campsites, farmland, and even some sports clubs or village halls. Many of these will include in the price: a power supply, toilet facilities, and possibly catering space. 3) The third and most expensive option is to host your wedding in the grounds of a hotel or manor house. The main benefit of this is that the views are likely to be exquisite and there is often accommodation available for you and your guests to get ready or to stay over. Some venues will have their own coordinator and you can even hold a civil ceremony at some locations. What’s included – power, loos, water supply, parking facilities and ability to camp if that’s what you want. The land – fairly flat, no divots, well drained, good access for vehicles and a pleasant outlook (such as a lake or a nice view). 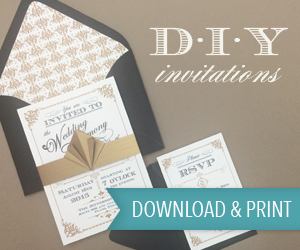 Once you’ve found your venue you need to count up all of your guests. The maximum that you’ll invite for the wedding breakfast and the evening ‘do’. And make sure you ask both your sets of parents – they’ll probably give you some you hadn’t even thought of! 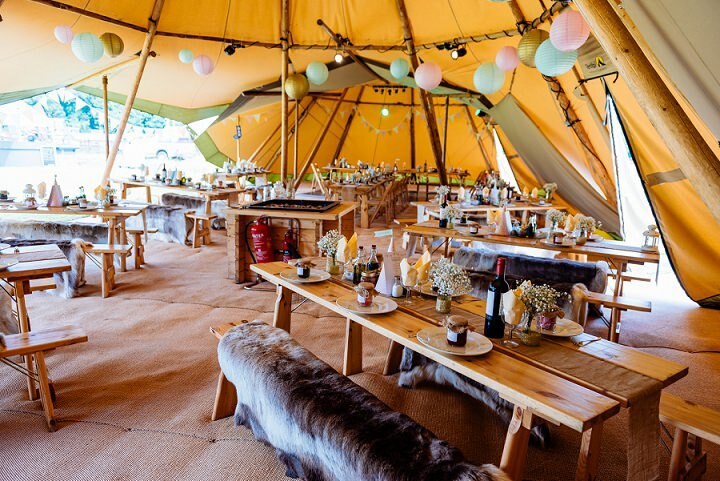 Once you have worked out the number of guests we can start to think about the tipi itself – how much space you will need, whether you want a bar, a chill out area and how you might furnish it. And that leads me onto perceived ‘con’ number 2…. The Weather! First and foremost, we need to dispel the myth – Contrary to popular belief it does not rain all of the time in the UK. In fact, there are more dry days than wet and even those when it does rain; it is not often all day. And for a lot of our couples their worry about the weather is another major ‘con’ in their minds. If you are a festival goer I imagine rain will not really worry you – maybe it’s just a chance to put on your diamante wellies, but if you are not a great fan of the rain then there are lots of things you can do to ensure that you are prepared for it and when the sun does actually shine it’s just an added bonus. So, thinking back to your guest numbers – you need to ensure you have enough room for everyone inside, just in case the rain does come. This means allowing some extra space for people to get up and move about in the form of either a bar area or some soft furnishings as a chill out area. It also means not adding and adding guests on – which we have had in the past – so that the tipis are full to capacity! Stick with the number you first decided upon or allow extra space in case you think of extras when you are planning. It’s a good idea to have a brolly bucket close to the entrance/exit which heads to the toilets so that the ladies can keep their hair dry when they have to powder their nose. Another sensible thing to do, especially for a spring or autumn wedding is to put out a basket of blankets, so that any older family that maybe won’t be up and dancing can pop one over their knees as the evening draws in. An open firepit which is a feature unique to the tipis, possible because they have a central smoke hole, is also a good option which really comes into its own in the evening. These are very popular as a focal point for people to sit around and toast marshmallows as dusk falls. If you are having a winter wedding then brollies and blankets are a must, as are the reindeer hides (which add a cosy feel to the tipis) and heating too. Heating is available all year around, but we find that it is rarely needed between May and September because even if the weather is not fine, the tipis retain heat from the sunshine very well and with every guest giving out a kilowatt of heat energy the tipis are actually quite warm. In truth, this can actually be one of the most exciting things about having a tipi wedding. It’s the fact that you can be completely yourself and can include as many ideas of your own as you wish. 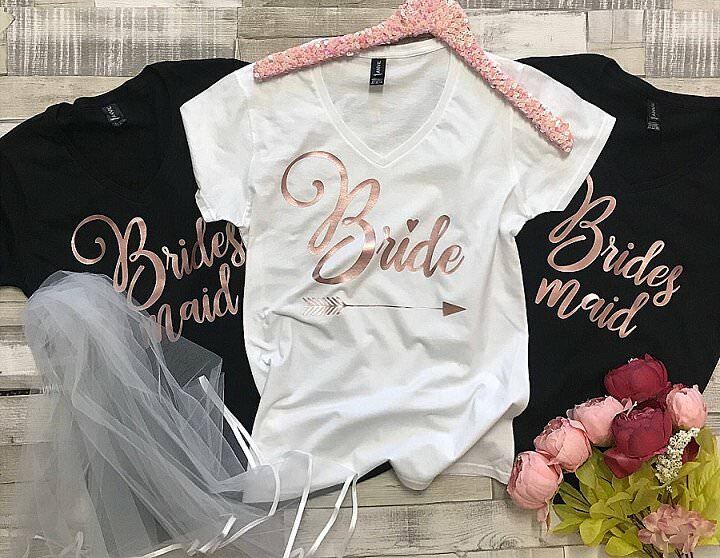 This gives a real opportunity to add something unique and novel that will make your wedding truly memorable. 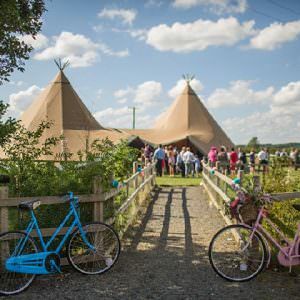 But if you don’t know where to start, tipis are very popular now and our Pinterest and Facebook pages have lots of ideas to get you started. 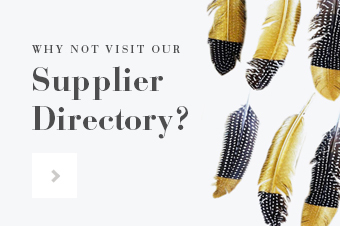 On top of that coming to an open day helps to show what you like, and tipi companies do have these, usually in the Spring and Autumn where you can go and see whether the gorgeous rustic style of the tipis suits you. The tipis with their natural beige colour and Scandinavian wood are a fabulous blank canvas. 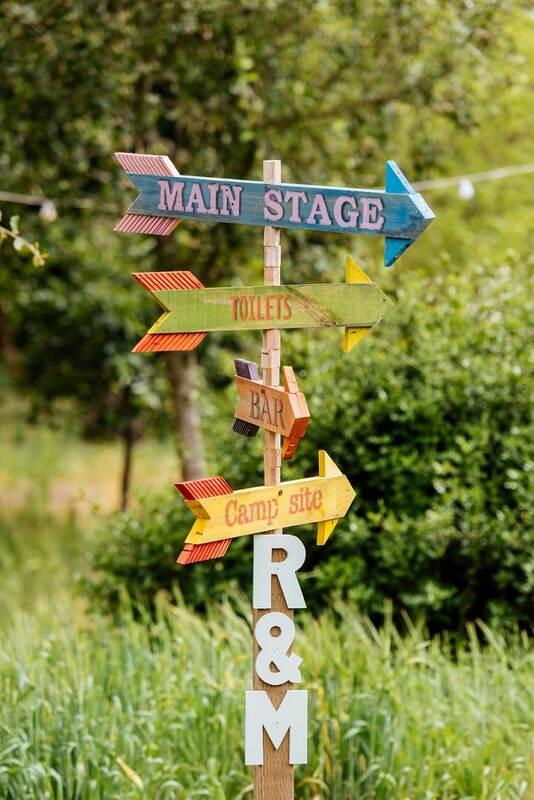 The wood also means that in fact you don’t need to spend the earth on decorations, simple flowers, a bit of bunting or pompoms or just a few fairy lights is often enough! The raised entrance to the tipis also mean that even if the weather isn’t great you still get the views of outdoors. However, we do also now have a pvc frontage as an option if there’s a bit of a chill in the Autumn months so that you can see outdoors and keep the warmth inside the tipi. The other ‘con’ that our couples worry about is sorting out things like power and toilets. The good news is that most of the established tipi companies, have built relationships with toilets and generator suppliers so that they know that they are not going to let your down. Plus, another positive of using our suppliers means you really don’t even need to think about the boring logistics so more time for having fun. 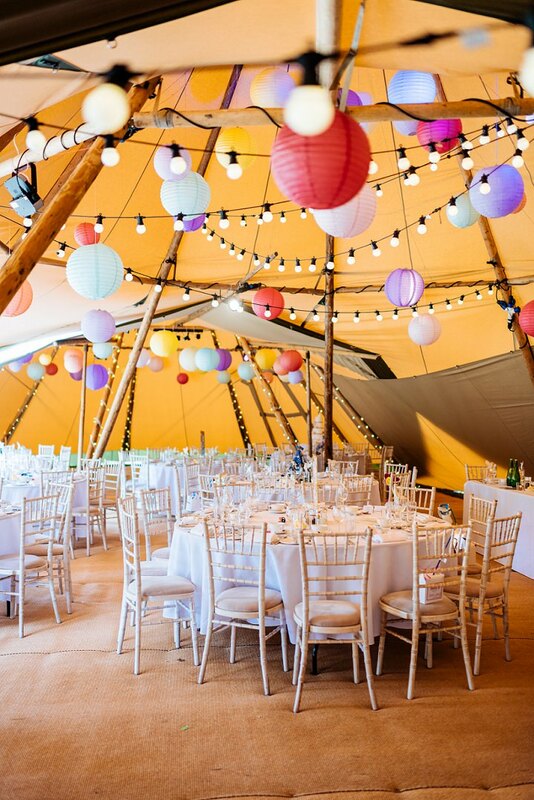 In fact, we have contacts which can help you in all areas of the planning, caterers that are used to working in the tipis, festival flag people, hay bales suppliers and camping villages – another pro of having a tipi wedding reception is that if you want allow whole families to come along to your special day then when its bedtime for the little ones they can be popped safely to bed while everyone else carries on partying. So rather than seeing a DIY tipi wedding as overwhelming and hard-work, with our expertise, help and guidance you can plan a fabulous, unique and novel wedding day. If you would like some help then I would love to support you further. Sophie, Debbie and I love talking tipis and helping you to get your ideas together. 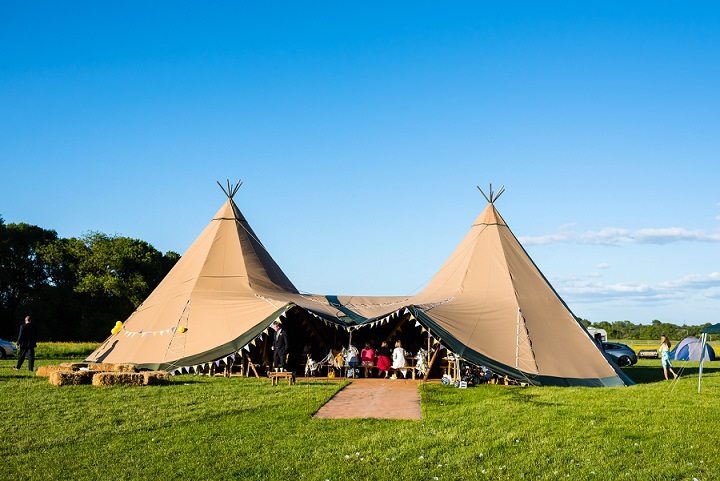 So if you are interested in having a tipi wedding that no one will forget, give us a call on 0121 663 1133 or drop me a line on: [email protected] / www.elitetents.co.uk and we’ll be delighted to assist you.